Chinese Premier LI Keqian traveled to Singapore on November 12 for five days to attend the 33rd ASEAN summit. During this official visit, the Chinese and Singaporean governments signed multiple agreements to strengthen their cooperation. It may be noted that for the first time a free trade agreement mentions the Belt and Road Initiative. 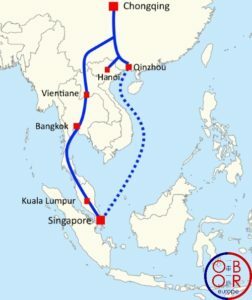 After several years of negotiations, Singapore and China signed a free trade agreement in 2008, which was strengthened during this meeting; and the two states committed themselves to promote the BRI and reaffirmed the importance of this initiative. for regional development. Until now China has signed multiple MoUs with partners regarding the BRI; but these agreements, although necessary, were not fully binding. The inclusion of BRI matters in this free trade agreement reflects a greater structuring of the BRI and the long-term commitment of both China and Singapore in this initiative. Singapore is often considered the gateway to ASEAN. The BRI could then become a priority for all states in the region. Cooperation between Singapore and China is old and fruitful. Singapore has been strongly involved at every stage of China’s development . As early as 1994, China and Singapore jointly developed the Suzhou Industrial Park, and in 2008, the two pledged to build the Tianjin Ecocity, another major project in northern China. The Chongqing Connectivity Initiative is fully in line with the BRI project. Thanks to this upgrade Free Trade Agreement, Singaporean companies will benefit from a wider access to the Chinese market, particularly in e-commerce, and there will be a tariffs reduction on some goods and services. Thanks to the BRI, Singapore is expected to consolidate its leading position as a financial center and a logistics hub in South East Asia. For Singapore, the BRI realizaiton is seen as an optimal way to strengthen relations with China and benefit from Western provinces’ economic development. Share the post "BRI and the China-Singapore Free Trade Agreement"